It’s being called a scourge, an epidemic, and even a plague. Whatever you call it, heroin use has skyrocketed across the region and left ruined lives in its wake, including 105 deaths last year in Jefferson County. Heroin and other opiates are especially devastating when you consider what they do to pregnant women and their children. That’s where Volunteers of America of Kentucky comes in. Freedom House, operated by Volunteers of America at its clinical campus on South Shelby Street, offers residential addiction treatment for pregnant and postpartum women and their children. It’s one of only three in Kentucky and the only fully accredited program of its kind in the Commonwealth. Women receive intensive therapy and case management, immediate referral to prenatal care, life and parenting skills education, and other support throughout their pregnancy and after they deliver. Programming at Freedom House also addresses the overlapping issues of substance abuse, mental illness, homelessness, intimate partner violence, child abuse and neglect, and child emotional and behavioral health issues. Since the program was created, 93 babies have been born healthy and drug-free to women receiving services. One of those women is Katie Warren, a 25-year-old Bullitt County native who was using Opana, an opiate, when her daughter, Ella, was removed from her custody. When she got pregnant for a second time, Katie turned to Freedom House. She credits the program not only for saving her life, but also for teaching her how to live. While in the program, she lost Ella’s father to a heroin overdose, but found the support she needed among the staff and fellow clients at Freedom House. Soon after, she delivered a healthy baby girl, Aubrey, now 2. Katie Warren, a graduate of Freedom House, with daughters Aubrey (left) and Ella. Today, Katie is two-and-a-half years sober, working full time, attending college courses, and raising her daughters in an apartment of their own. She often returns to Volunteers of America to share her success story, most recently with First Lady of Kentucky Jane Beshear. “I hope the people in Frankfort will put more money into this program,” Katie said during that visit. Many share Katie’s feelings, and the 2015 General Assembly session could open up the door for increased funding for addiction treatment. Multiple bills addressing heroin use and trafficking are expected to receive consideration, although legislation stalled in the last two sessions because lawmakers disagreed on fair penalties for drug traffickers. Corporate and individual support is making a significant impact, allowing Volunteers of America to double the capacity of the Freedom House and add services. Judie Parks is one of those people galvanizing community support for Freedom House through her professional endeavors. 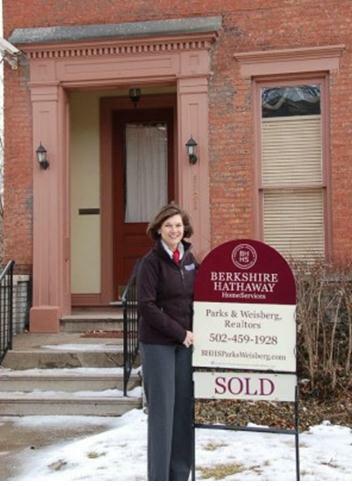 The broker/owner of Berkshire Hathaway Parks & Weisberg Realtors first learned about Volunteers of America when she and President Elect Jennifer Hancock met while participating in Leadership Louisville’s 2011-2012 class. They hit it off; Parks was looking for a service opportunity that she and her niece, could perform together while she sponsored her niece in preparation for her Catholic confirmation. Since then, Parks has taken a lead supporting Volunteers of America in a variety of ways: tutoring homeless children at Volunteers of America’s family housing program, holding an annual holiday gathering with family and friends that also serves as a gift collection drive for Freedom House families; and joining the organization’s giving society. Parks also represented Volunteers of America in the sale of one of its properties and generously donated her commission to support the organization. She was voted onto Volunteers of America’s Board of Directors earlier this year. Judie Parks, broker/owner of Berkshire Hathaway Parks & Weisberg Realtors, donated her commission from the sale of a Volunteers of America property back to the organization. •Make an end-of-year or recurring gift online at www.voaky.org. •Take a tour of Freedom House. Contact Jennifer Hancock at (502) 636-4649 or JenniferH@voaky.org to schedule your tour. •Learn more about the program at https://www.voaky.org/womensrecovery.